The hubbub of getting married can make you miss small mistakes here and there. Sometimes those mistakes show up on your marriage certificate, either because you accidentally provided the wrong information or the clerk made a mistake. Procedures to correct an incorrect name on a marriage certificate vary by location and by the amount of time that has passed since you received the certificate. Always double-check with the office from where you got your certificate to learn what its amendment procedure entails. Look over your certificate carefully before having it finalized. This is the time to catch any mistakes because they are usually quick and free to correct before the certificate is finalized. Some states have you look over the certificate first, while others, like the Office of the City Clerk in New York City have you watch a monitor as the clerk types in the information. Verify that you know which names are legally supposed to be on the marriage certificate. It may turn out that the name you consider incorrect is there for a reason. For example, the California Department of Public Health says marriage certificates issued in the state of California list the legal names of the bride and groom before marriage, rather than any marriage-induced name changes. In this case, the last names wouldn't reflect any planned changes such as the bride changing her last name or including a hyphenated version. Contact the office where you received the certificate immediately upon noticing an incorrect name. Some localities set time limits past which fees increase for the procedure changes. New Hampshire, for instance, charges a fee if you don't apply for a corrected license within two weeks of receiving the first one. Bring the incorrect certificate, proper identification as required by the particular office you are visiting, and any supporting documents or information necessary. In some places such as Kansas or New York City, the office that issued your license will direct you to bring or mail documents to a particular address. That could be the same office, as is the case in New York City, where you can mail, file online or bring back to the Office of the City Clerk a notarized amendment application with your identification, the original certificate, and copies of supporting documents that prove the validity of the correct name. Kansas, however, asks you to mail everything to the Office of Vital Statistics. Open a circuit court case if that is the route your state uses to correct marriage certificates. You will petition the court for an order to change the certificate to the correct name. Ask the court what you will have to provide, as the court may need certain documents notarized or require certain information pertaining to the original marriage certificate. 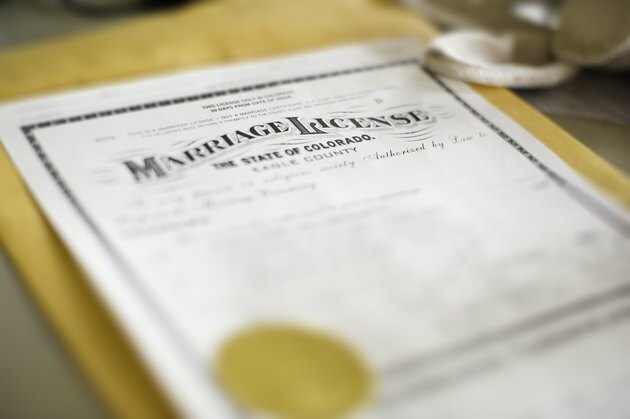 If you are trying to change a name on the marriage certificate because you want a different name on there, and not because the incorrect name was a true mistake, you might not be able to use the amendment procedure depending on where you live. New York City does not allow its amendments to be used to change a name on the certificate for any reason. If you are changing your surname for reasons other than to correct an error, you and your spouse must apply for a new marriage certificate and go through another marriage ceremony at the Office of the City Clerk. If mailing documents, do not send the originals of things like your identification or birth certificate. Ask the office if it will accept a photocopy, and if so, should it be notarized. Each state has a different procedure and requires different specifics.